Soviet poster art from 1941-1945 is being rediscovered. Chelsea's prominent Andrew Edlin Gallery is currently offering a unique chance to view Soviet war posters with its exhibit “Die, Nazi Scum! 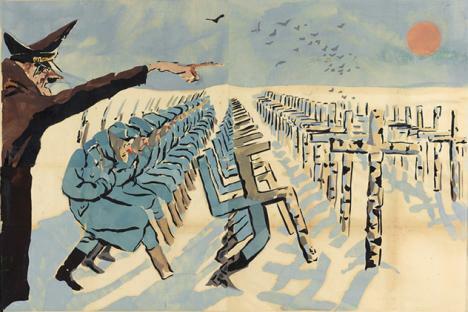 Soviet TASS Propaganda Posters 1941-1945.” The collection of World War II posters, forming a direct message to the Third Reich and the Nazi machine, were produced by the nation’s greatest talents--on order of the Soviet government. Formed by popular Soviet artists, writers and poets in 1941, Okna TASS Studio played a significant role in the course of the war, successfully raising the fighting spirit of the Red Army, as well as millions of homefront workers. One of the most powerful ways to express the spectrum of emotions toward the invaders was through satire. Some of these witty caricatures of enemies became iconic. During the war, Okna TASS Studio produced a poster almost every day, which resulted in 1,240 works after 1,418 days of war, mostly hand-made stencils as oppose to machine lithography. Edlin’s space on lower 10th Avenue is located across the street from New York’s Highline and a host of high-end galleries. “Die, Nazi Scum!” was scheduled to close on Jan. 7, but due to public interest, the show has been extended through Jan. 14.